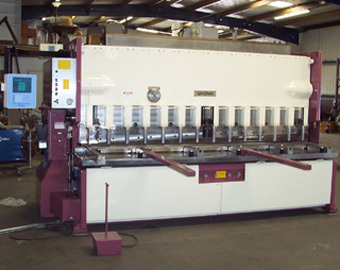 The GINGRAS shear/press brake is very easy to use and requires only a few hours of training. Your operator will appreciate the GINGRAS’s diversity and flexibility compared to conventional machines. For example, the GINGRAS’s versatility allows for the cutting of a leg of angle iron lengthwise or the beveling of its ends. The upper rotating ram makes it possible to insert complex-shape parts. A combined shear/press brake machine takes half the surface taken by two machines, and requires a lot less maintenance. The shear/press brake is offered with CNC control and security devices, to be brought to compliance with the CSA Z142-10 security standard. Bending a part on a brand new 10ft x 80 tons GINGRAS. Changing mode from shear to press brake. Close up shearing a 1/4" mild steel plate. Our new 3 axis (X, Y1 and Y2) GINGRAS in shear mode. Système de mesure d'angle sur la caméra de sécurité Pilz.Angle measurement on the Pilz safety camera.